Focus on efficiency: create ads with great conversion rate with our easy-to-use online tool! We provide everything you need to create your best advertisements and start selling more. Hundreds of banner ads templates proven to convert are now at your disposal! Whether you need a Google ad builder or a Facebook ad builder, you're in the right place. Just choose the appropriate ad template for your business and start designing right now! 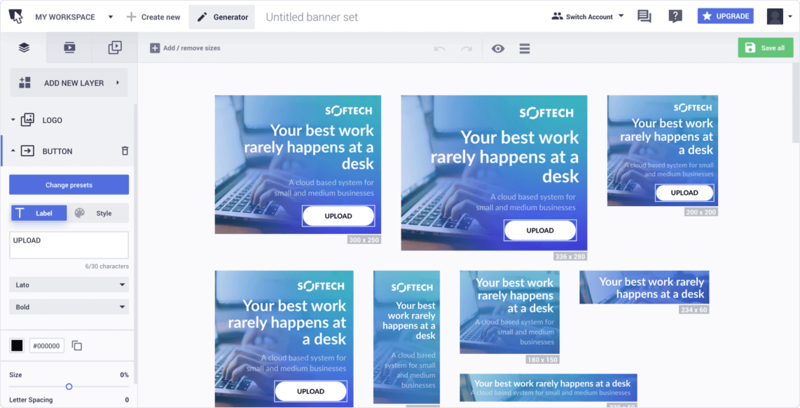 With the new Banner Generator, you can create ads for all the banner sizes you'll ever need. Try our online advertisement builder and save time by creating more banner ads sizes at once. It's easy, just choose the ads sizes, choose a template and personalize it your way! If you want to achieve the best ROI for your online advertising campaigns, you need to have a great strategy. Keep an eye on the competition, test what works for you and keep in mind some of the most important industry best practices. You should always A/B test before you decide on the banner ads you would like to use. All target audiences are different and respond to different messages. No matter how good your ad is, if it’s seen by an indifferent audience, you won't get the expected results. Use the advanced targeting and retargeting features and optimize your ads. People respond better to quality visuals, so it's important to create beautiful ads that stand out. A great call-to-action can make the difference between a visitor and a client, so don't forget to add a relevant message to attract customers. When time matters, you need a flexible tool that will help you save hours of work with its amazing features. Keep all your ads in one place and edit them anytime you need with our all-in-one free display ad builder! Looking for an inexpensive and easy-to-use tool to create video ads and animations? You are in the right place! With the new timeline feature, you can create animations faster than ever. If you need to embed a HTML5 banner but you have no coding skills, don't worry! All you have to do is create your visual with our drag-and-drop editor and we'll take care of the rest for you. Meet all the Google Ads requirements and create highly efficient display ads with our Google display ad builder. Get one step ahead of your competition! Create brilliant static or animated Facebook ads and optimize them to get the best results ever. You'll never worry about not having enough visuals for your Facebook ads again. Experiment with all the social media ads and create sponsored tweets to meet your audience. Advertise on Twitter to get the best engagement rates! Reach people where they spend most of their time: on their mobile phones. Create the best Instagram Ads and get ready to outdo your competition! 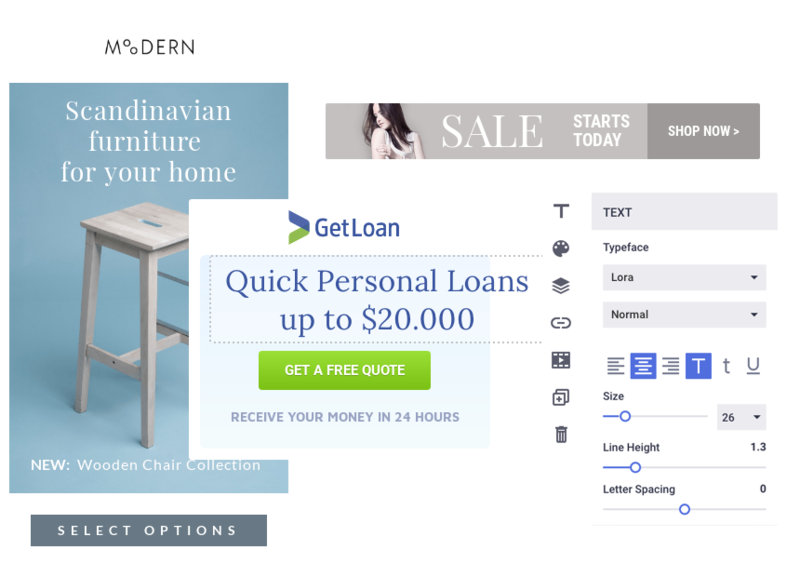 Display advertising does not have to be complicated. Our HTML5 ad builder helps you simplify your workflow and get results faster! © 2018 Bannersnack. All Rights Reserved.